The Namib desert is a remarkable but fragile ecosystem, containing many endemic species. 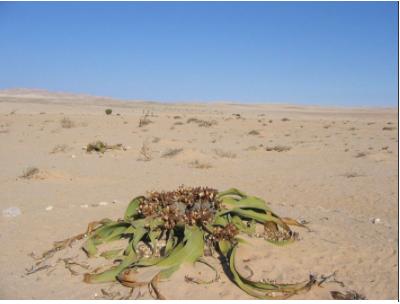 One of these is the desert plant Welwitschia mirabilis, one of the longest lived organisms on the planet,with a lifespan of 500 to 1500 years. In 2012, areas of the Dorob and Namib Naukluft National Parks were utilized as site locations for the filming of a sequel (Fury Road) to the popular Mad Max film series. During these operations, vehicles were permitted to drive off the official tracks, with the understanding that the area would be rehabilitated immediately thereafter. Film crews also camped in previously pristine areas. As might be expected, these activities scarred the surface of the fragile topsoils across many thousands of hectares, and sensitive plants and animals were in direct line of driving. No Environmental Impact Assessment (EIA) was carried out beforehand, so there is no baseline to assess the extent of damage caused by the filming. To rehabilitate the area after filming, chains and nets were dragged across the landscape to partially erase the visual scars. However, these activities further damaged an even wider area, and dragged over surviving plants and animals.